A good book is good; five is even better. In this next instalment of our Five Books series, Twistleton recommends his favourite books on Christian spiritual practice. Fr John is a broadcaster and author of books including Meet Jesus: A Call to Adventure and Using the Jesus Prayer (Abingdon: The Bible Reading Fellowship). Say to yourself very often about everything that happens, ‘God loves me! What joy! And reply boldly, ‘And I truly love Him too!’ Then go quite simply about all that you have to do and do not philosophize any more. For these two phrases are beyond all thought and do more for us than any thought could do; they are all-sufficing. Christian spiritual practice is life lived with such awareness. That’s why I go back regularly to Abbe de Tourville's Letters of Direction - Thoughts on Spiritual Life. When it comes to practical Christianity I find this cleric though he died as long ago as 1903 to be a gem. The English translation has an introduction by Evelyn Underhill notingthe author’s invitation for the reader to ‘learn to laugh at his own hurly burly’ and refrain from taking himself so seriously. I think my copy was given me by former Pusey House Oxford Principal Hugh Maycock whose commendation on the back of the Amate Press issue says rightly that through reading the book the reader will learn to rejoice in, and depend more and more upon God’s unaltering love for him and his intention to give him eternal happiness and fun in heaven. I begin my ‘Five Books’ with one short, deep, accessible, relatively undated and focused on Christian basics. What’s powerful is its perception of Christianity as forward progress we’re called into, opening up horizons for us, those in our orbit and ultimately the cosmos. This vision is allied to goodsense. Let our effort be always towards greater breadth and generosity within ourselves… let us put up with ourselves in charity and try to rule ourselves as we should like to rule others… using towards ourselves much gentle and persuasive skill, which will turn us inside out as delicately as we turn a glove. The writer was an invalid most of his life andspeaks with authority on suffering and death. There’s evangelical confidence with humour and the two together make it a spiritual tonic you go back to again and again. Life limited by death? Nonsense! That is a great mistake. Death hardly counts; it is a mere appearance; we already have eternal life and that reflection should give us great tranquillity, as those who feel themselves to be eternal. From French Catholic Abbe to plain-speaking Yorkshireman! In George Guiver CR's Everyday God a monk of the Anglican Community of the Resurrection at Mirfield provides a deep yet simple guide to Christianity full of stronganalogies. God's grace is compared to an infrared lamp or to the pickling of onions. What matters is to get soaked in it!Doctrine is likened to photographs in a family album. What is most real is the family, not the album.Nevertheless doctrine - like the photograph album - is a vital help to the Church in preserving her memory and keeping her true to herself and her Lord. ‘Everyday God’ encourages the discovery of God as someone in all things. In prayer and worship we taste him ‘neat’ so we can taste the same flavour in the people and things of everyday life. The Church is a place for ‘learning the knack’ of all of this. The Eucharist is at the heart of her life but though Sunday worship brings us back to the boil…we quickly go cold, and we need to be brought back to the boil again and again. That is why we have to pray regularly.Fr. Guiver’s imaginative book exhibits infectious enthusiasm for the wonder and riches of the Christian tradition. The best teachers can put awesome things in ordinary words for the unschooled. Rowan Williams's Being Christian - Baptism, Bible, Eucharist, Prayer exercises that gift providing a simple, clear yet profound taster of Christianity serving to guide seekers into the way of Christ. It will also lead Christians to see afresh the profundity of their faith. To Rowan Williams Christianity is 'a certain way of being human'. It's humanity in its right mind as God intended it which Jesus came to restore. To be baptised is to live close to painful chaos around us and within us. It is 'to be where Jesus is', just as prayer and eucharist are to enter his passion for God and humanity. Christians have solidarity with humanity, not status above it, just like Jesus. Ours like his is to be a listening and insightful life and this book abounds with insight into God and humanity. I like his invitation to Christ-centred reading of the Bible that tells you exactly how to relate all the different bits to the centre... how that bit in Leviticus and that bit in Ezekiel come alive when you relate it to Jesus... the whole massive history of Christian commentary on the Bible is just an ever-expanding exercise in that reality: that of relating different bits to the centre. The Bible offers law, history and poetry and we are invited torespect that diversity avoiding both over poetic (Cavalier) interpretation and literalism. Daniel Wolpert's Creating a Life with God - The Call of Ancient Prayer Practices is fruit from a life immersed in the faith and prayer of the church through the ages. As an ecumenicalPresbyterian Wolpert draws on wells across the Christian tradition. This book is both inspirational and practical through its excellent appendix with ‘step-by-step’ instructions on contemplation, Lectio Divina scriptural prayer, the Jesus Prayer, seeing God in nature, journaling, use of the body in prayer etc. with individual and corporate exercises. I value Daniel Wolpert’s presentation of the Examen, how reviewing our lives employs the vehicle of time to show deep seated needs and strengths. Just as an aeroplane leaves a vapour trail in the sky, Ignatius realises that God leaves a trail of experience in our lives. The key to finding the path that God leaves... is to search for the evidence of that trail of experience. In presenting the Examen and other disciplines Wolpert majors on the struggle we have facing ourselves and how Christian disciplines help us to know, love and forget ourselves. The dramatic effect of tithing in its challenge to self interest is spelled out as is the impact of the Jesus Prayer. The practice of the repetitive prayer acts like a magnifying glass held up to the sunlight: it focuses an intense beam of spiritual energy on one point....slowly burns a hole... and we ‘pop out’ to the other side - into the kingdom of God. This description rang true to my own experience of the Jesus Prayer and built the author’s authority in my mind as I read on through the variety of God disposing prayer practices he ably and convincingly presents. This valuable book majors effectively on aids to the struggle of facing and forgetting ourselves. 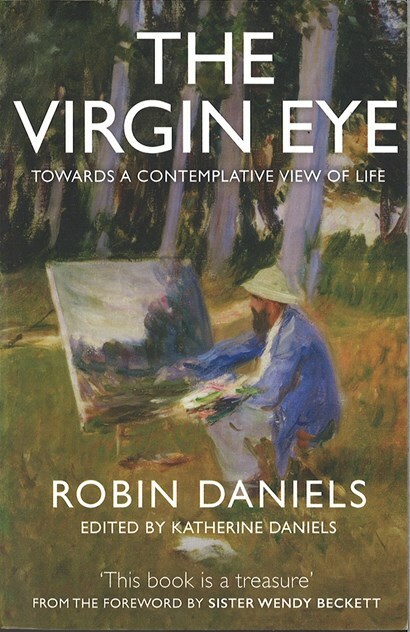 Robin Daniels's The Virgin Eye is a heavyweight contender in terms of refreshing your Christian discipline. It’s fruit of a lifetime of Christian service rooted in prayer, listening skills and psychological insight. I was captivated by Daniels’ analogy of Cathedral closes with his repeated counsel of making space around things to make more of them. Theposthumously published book is rich in quotations. St Francis de Sales speaks of ‘seeing God’s eyes upon you filled with incomparable love’ and counselling ‘practising little virtues with a heroic spirit’. Alexander Pope is quoted on the humility both to help and be helped: ‘There is a pride in giving and a pride in not receiving’. Mindfulness is examined with both Christian and psychological insight that’s also applied to wisdom about maintaining close relationships. By stopping to pray before and after tasks, spiritual or social, we attain a Spirit-given freshness. Time we spend in owning the shadow side of self is repaid in greater capacity to give of self to God and neighbour, or find ‘the virgin eye’ to see God in all things. I valued the book’s repeated call to simplification for we are made rich not only by what we have but also by what we let goof.